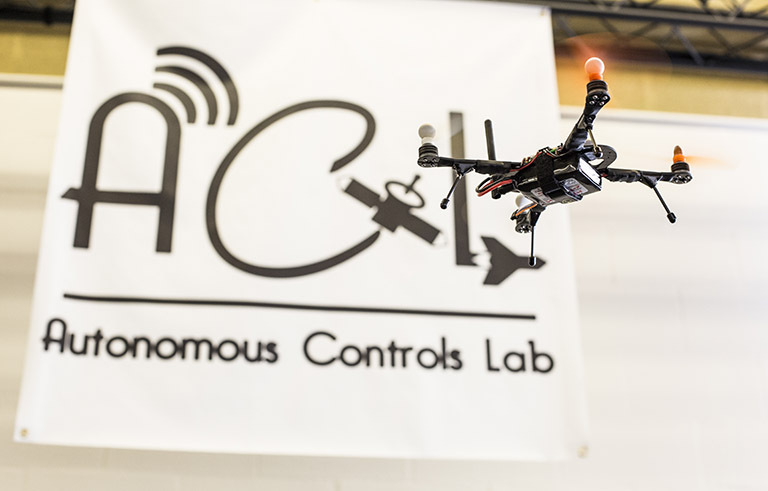 The Autonomous Controls Laboratory develops algorithms that enhance the on-board decision making and autonomous capabilities of robotic systems. Integral to the autonomy of a robotic system is the ability to plan trajectories (or paths) that adhere to certain vehicle limitations and safety constraints. For example, the on-board computer of an autonomous car should compute paths that are free of excessively sharp turns, that avoid collisions with other cars, pedestrians, and objects, and that comply with the local speed limit. Such trajectories can be computed in a multitude of ways, very few of which can be executed on-board and in real-time in a deterministic and reliable manner. The flight demonstrations featured here showcases an on-board algorithm that computes quad-rotor trajectories quickly and reliably. This ability is leveraged to perform agile maneuvers, and to avoid static and mobile obstacles.